Carefully curated guides to cultural, artistic, historic and outdoor places, along with incredibly detailed lists of the best shopping and hotels in a city. Dimensions: 9.5" x 4.25" x 0.1"
Nice maps! Suitable for framing after use! I got Grand Tour set for my parents, who, conveniently, were going to almost all of the locations that were in this set. They sounded like a gift for them to have, especially with their durability. Once I gave them to my parents, they actually got another set of maps from their travel agent (typical tourist maps) but when I compared these maps to those, the detail in the other was a lot better, especially when it came down to information and locations of the major tourist attractions. When it comes to planning a trip, the Internet and guidebooks are a great source of information. But once you arrive at your destination, there’s nothing like a real map to help you get your bearings. Your smartphone may have GPS, but the small screen doesn’t show the big picture and using it while traveling can be costly. Part map, part curated guide, Red Maps are a lightweight, easy-to-use and beautifully designed solution no city should be explored without. In addition to streets, neighborhoods, and major landmarks, each map features a selection of stores, hotels, restaurants, museums, parks and more carefully curated by a team of travel experts and updated every four to six months. Designer and company founder Jim Leniart has a strict no advertising policy—if it’s on the map, it must be noteworthy. 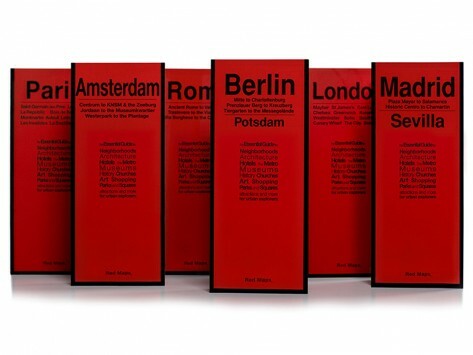 Made in the USA, Red Maps are matte laminated for water resistance, feature a no glare finish, and are available for 14 American Cities, 11 European cities and also come in gift sets. From the elegant design to the thoughtfully curated points of interest, Red Maps’ attention to detail takes the travel map to all new places.